This is rollicking good time big band music from north London enthusiasts the Spanner Big Band. 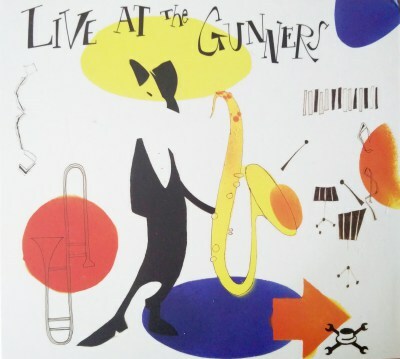 The band perform their classic big band repertoire and more with power and gusto in shows recorded at The Gunners pub in Finsbury Park (close to the old Arsenal ground at Highbury, obviously) over total of three nights. In these days of laptop DJs, it’s really something to see a full sized big band in full flight, and to see such a thing in a packed pub is an even greater reminder of the power, exuberance and flexibility of the classic line up of saxes, brass and rhythm. Leader Dan Spanner (also of Spanner Jazz Punks) is heard on alto and clarinet, taking a well earned feature on Sing Sang Sung, Gordon Goodwin’s (Big Phat Band, California) answer to classic Benny Goodman feature Sing Sing Sing. There’s plenty of good musicianship on show over the 15 tracks here. Nick Walters takes a neat and flowing trumpet solo in the opening One On One. The band’s fondness for a Basie-ish direction is well displayed, with Sammy Nestico’s Switch In Time (taken at quite a lick with some nice trombone from Tim Cox) and Doin’ Basie’s Thing, along with Neal Hefti’s Splanky. The movies and TV get a look in too – a sharp rendition of Henry Mancini’s A Shot In The Dark (a theme from the Pink Panther, but not that Pink Panther theme)moves nicely from tiptoeing stutter to swaggering confidence, and the Barry Gray’s Thunderbirds theme (always a winner in this house) launches with cries of 5-4-3-2-1 and a spectacular lift-off. The band also take time to demonstrate their jazz chops – a nice arrangement of Charles Mingus’ Fables of Faubus is capped with a nice tenor sax solo from Bettina Schmid. A snappy Sweet Georgia Brown featuring the tenor of Dave Blackmore brings proceedings to a close. With plenty of favourites, good recording and a lively atmosphere, this CD will clearly make an excellent gig souvenir. More to the point, it’s an encouragement to all big band fans to get up to Finsbury Park and enjoy the Spanners on home turf. This kind of group is tough to run and even tougher to get right, and Dan Spanner and his comrades deserve applause and support.